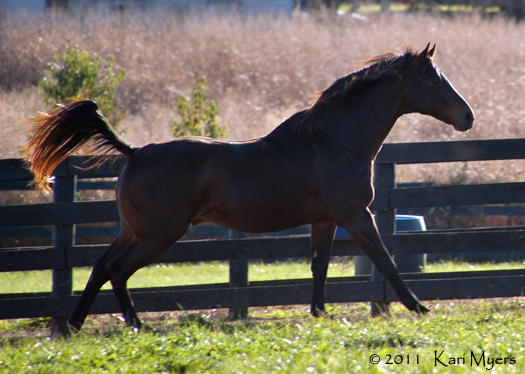 Nov 1, 2011: Commentator races to the top of his paddock for carrots. Old Friends retirement farm in Georgetown, KY is one of the best places to visit in the area. 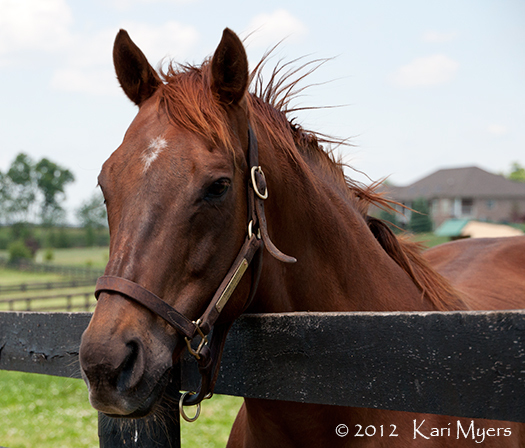 Take a tour with one of their knowledgeable guides and feed carrots to some of racing’s modern legends. So much fun! One of my favorite horses of the last decade is Commentator, a speedy son of Distorted Humor who won over $2 million on the track. As a gelding, he ran from 2004 to 2009, setting track records along the way and winning the Grade 1 Whitney Handicap on two occasions. His final race was a third try in the Whitney, where he finished 3rd. Commentator now spends his days racing around his huge paddock at Old Friends and chowing down on carrots from his adoring fans. May 2, 2012: One of the few moments where Commentator’s ears are pricked forward. This is a rare thing for him! May 2, 2012: Nom nom nom. 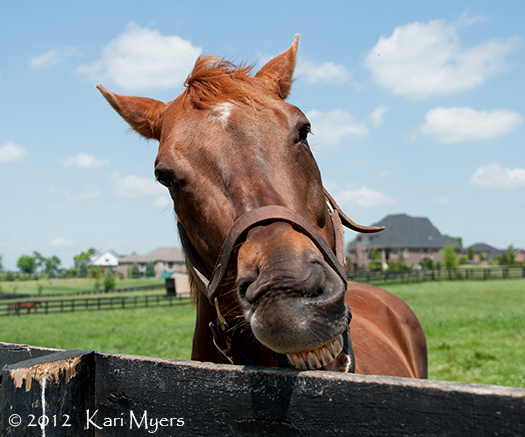 May 2, 2012: Insert carrots here. November 1, 2011: Special Ring and Popcorn Deelites take a moment to give each other a good back scratching. 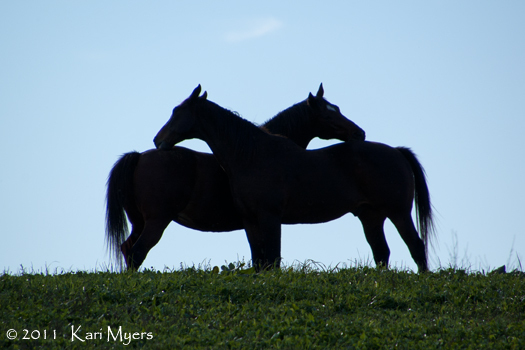 If you’re ever in Kentucky for a visit, Old Friends should definitely be at the top of your list of places to see. The retirement farm is located just outside of Lexington in Georgetown, and it’s also an easy drive from Louisville. Call ahead to schedule a tour for yourself or a group, and be prepared to do some walking! 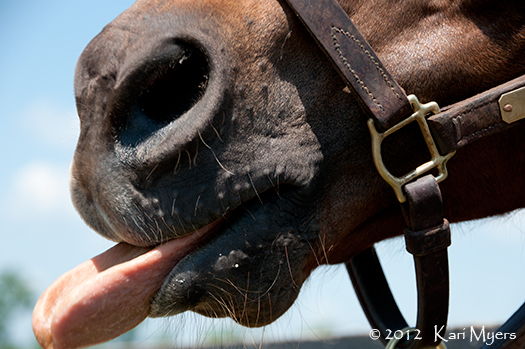 For a small donation per person, you get an hour or two of feeding carrots to some of Thoroughbred racing’s royalty. It’s so much fun to see them up close, and the guides are a wealth of information and always have a story to tell about each retiree. Old Friends accepts stallions, geldings, and mares who have been retired from racing or pensioned from breeding and stud duties, so they’ve got a huge mix of champions, hard luck stories, and blue collar runners. It’s also probably the greatest collection of famous Thoroughbreds on the planet. Two of the favorites at the farm are the geldings Popcorn Deelites—whose sire Afternoon Deelites also resides at the farm—and Special Ring. These two had very different racing histories, but have become best friends and paddock mates at Old Friends. Special Ring won almost $1 million on the track and was a multiple Grade 1 winner on the turf, which is no small feat. Popcorn ran mostly in lower level races, but his claim to fame comes from his appearance in the movie Seabiscuit with Tobey Maguire. 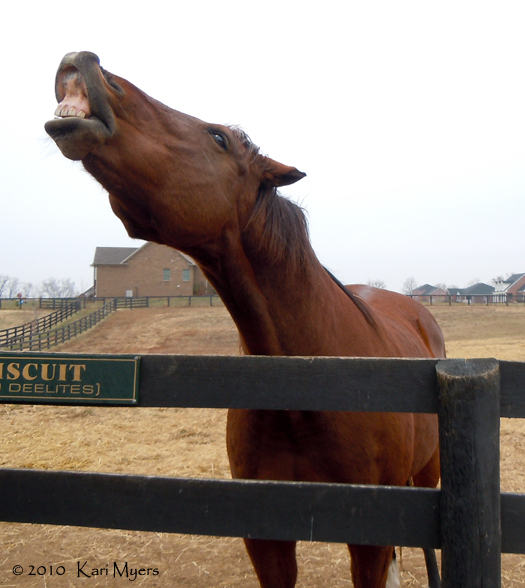 That’s right, Popcorn played Seabiscuit in several scenes—it seems he was really good at breaking from the gate when they were filming races. November 3, 2010: Special Ring is so used to showing people his lip tattoo that he’ll do it for a carrot. November 1, 2011: Popcorn Deelites ignores his fans to watch some birds playing in the trees. 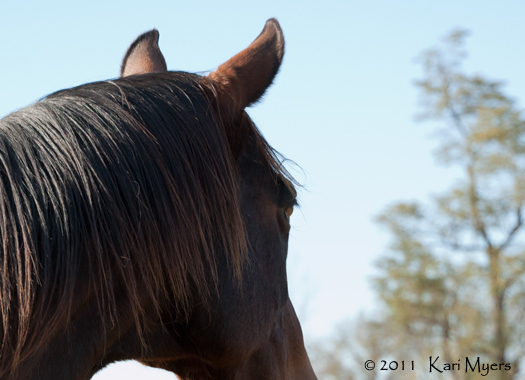 November 1, 2011: Afternoon Deelites, sire of Popcorn Deelites, is insanely beautiful even when covered in mud. 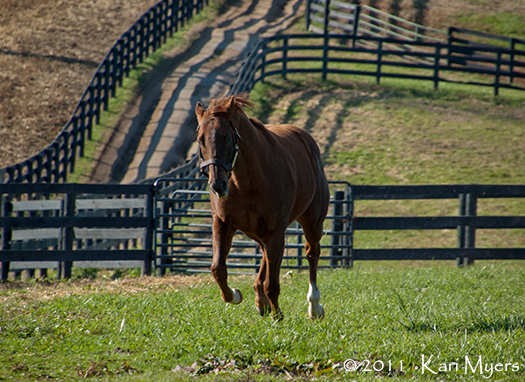 November 1, 2011: Afternoon Deelites races the golf cart up the hill to get his dinner. 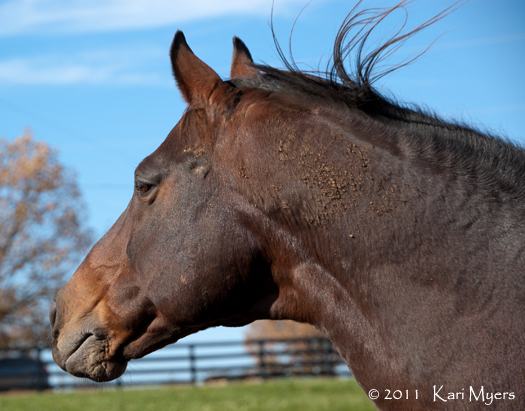 Prized won several graded stakes, including the 1989 Breeders’ Cup Turf, and ran against some of the best of his generation. In his final race in ’91, he lost the Hollywood Gold Cup to another Old Friends resident in Marquetry! Prized was pensioned from stud duty in 2011, but one of his best sons—and one of my all-time favorites—is the Bradley family’s Brass Hat. 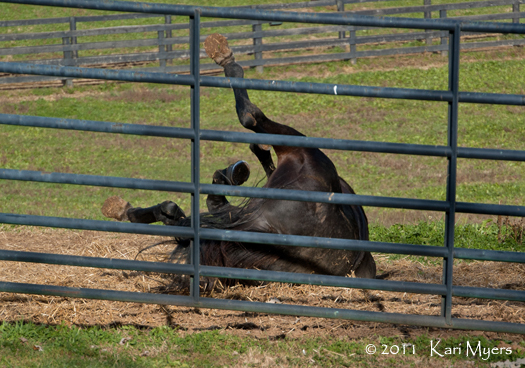 November 1, 2011: Prized finds the softest ground in his paddock, and with no regard for dignity, has a good roll. Sunshine Forever was a multiple Grade 1 winner and Champion turf horse of ’88. His final race was the ’89 Breeders’ Cup Turf which he lost to the aforementioned Prized. It seems that many of the horses at Old Friends raced against each other at one point or another. Sunshine had a classic pedigree, but was sent to Japan for stud in 1995 after a lackluster career in the states. Michael Blowen, founder of Old Friends, brokered a deal to bring him back to the US for retirement along with Criminal Type and Creator in 2004. 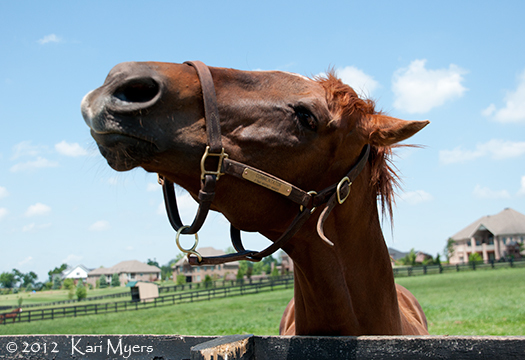 It’s widely known that Sunshine Forever is the smartest horse at the farm. Just ask him a question, and he will nod in answer… and possibly in hopes of a carrot or two. 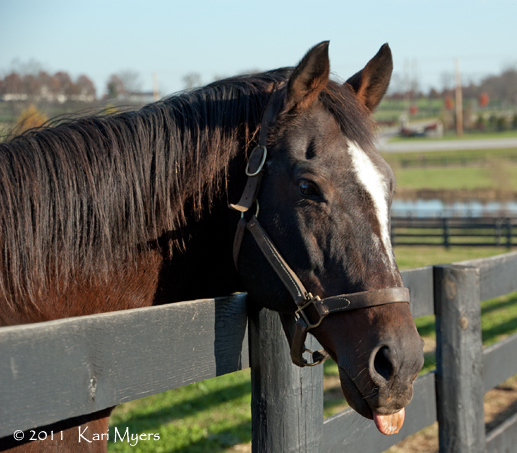 November 1, 2011: Sunshine Forever stuck his tongue out at us for a solid 5 minutes. 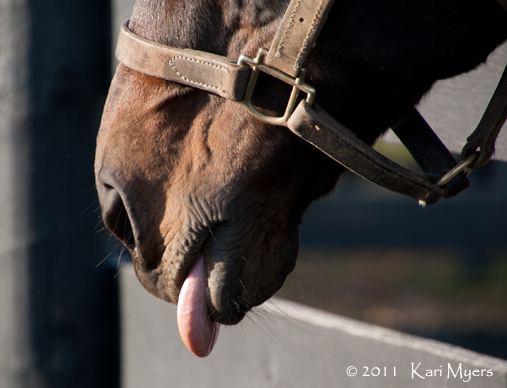 November 1, 2011: Sunshine Forever made certain we got a good look at his tongue. I’ve taken tons of photos at Old Friends over the years, so this is only the first of many entries!